Christmas is my favorite time of the year, and I have my family, especially my parents, to thank for that. My parents had four children born in a span of six years. Given that 2:1 ratio, there must have been holiday stress when I was a child, and I’m sure they could tell me stories of that nature. However, looking back at age 30, I don’t remember any of those stories. What remains is their overwhelmingly positive influence during the Christmas season. My mom and dad were/are the king and queen of Christmas. Mom decked the halls inside while dad made sure the lights outside were always the best and brightest on the block. Mom teamed with grandma to make the world’s greatest Christmas cookies while dad played Christmas carols on the piano. And so on and so on. I owe an unpayable debt of gratitude to both of my parents for the love they showered upon me and my siblings growing up. Of course they loved us all year ’round, but they also always had a way of making Christmastime feel special. That’s why, even today as adults, my siblings anxiously await this time of year when we can all be together as a family. Of all the Christmas traditions that I grew up with, one of the most uniquely Hubert traditions is one that is still going strong as of 2014. 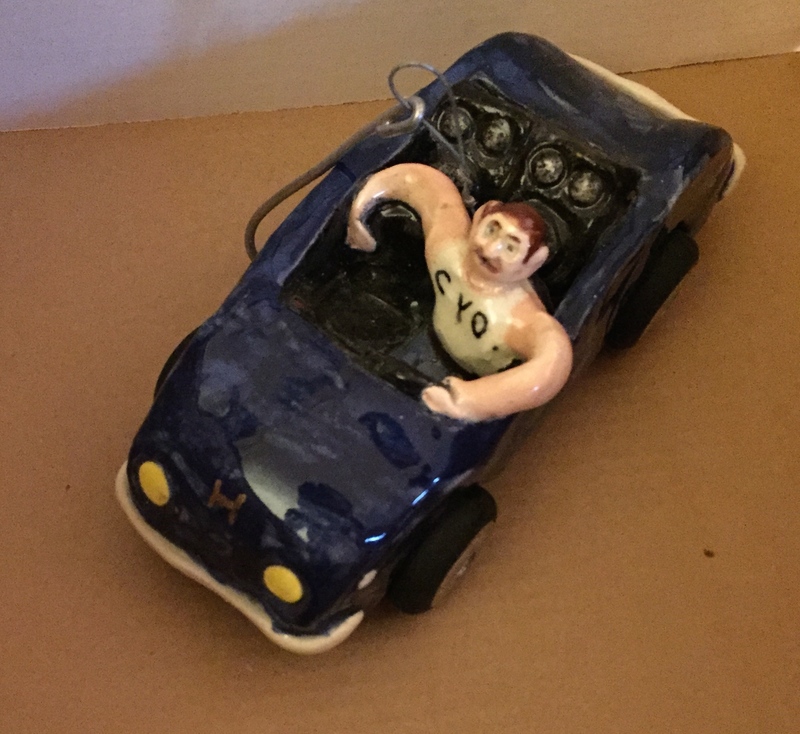 Each year since I was born in 1984, my dad has made me a personalized ceramic ornament. For anyone who doesn’t know, my dad is a professional ceramic artist. He has also taught ceramics at Mercyhurst University since before I was born. In the first few years of life when I was an only child, I got spoiled and my dad sometimes made more than one ornament for me. Then, after my siblings came along, the tradition became one ornament per year for each child. As we grew up and began to have interests, we were able to give input and select what we wanted as our ornament for that year. Each year, shortly after Thanksgiving, Dad would ask us what we wanted. Some years, there was an obvious milestone worth commemorating. Other years it was simply a matter of showcasing something or someone we were a fan of at the time. After everyone submitted their ideas, Dad would begin working on the ornaments. Getting from idea to finished product is a multi-step process that includes hand-sculpting, firing, and glazing each ornament to give it a personalized touch. My dad puts hours of work into each ornament (a time period of days if not weeks during the month of December). Then, either shortly before or on Christmas Day, the new batch of ornaments is revealed to us. 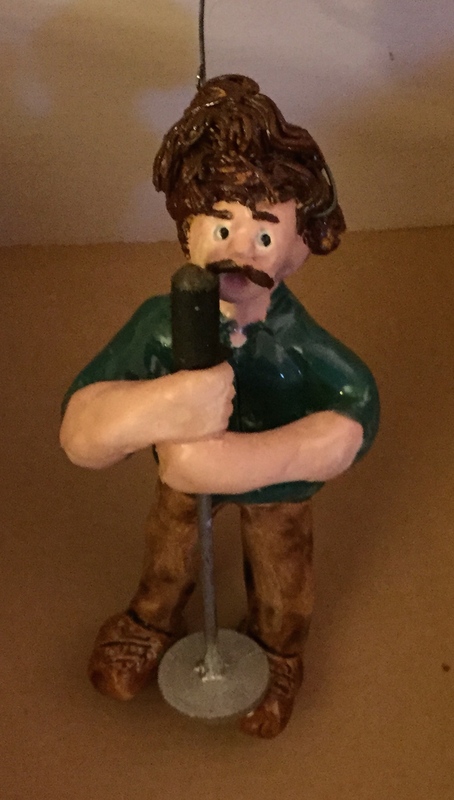 At different stages of the tradition, other family members (and, later in life, our significant others) have received a Tom Hubert original, but only the four Hubert children have received one every year. This photo was taken Dec. 7, 2008, just prior to decorating my brand new tree for the first time living in my apartment. A few of the ornaments pictured here would be lost 364 days later in a fire. 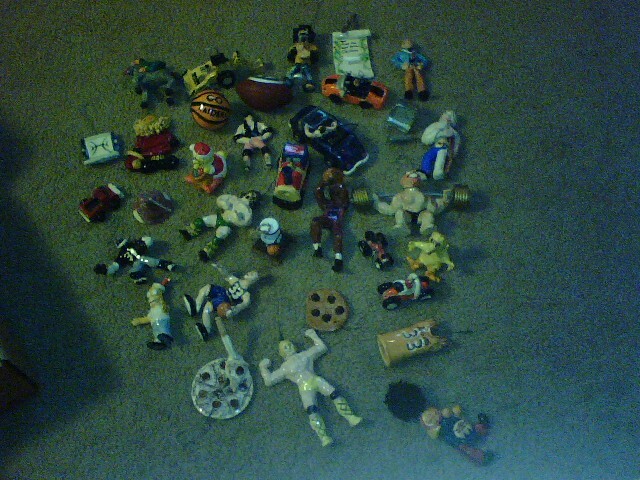 When I moved out of the house into my first apartment in 2008, my collection of Christmas ornaments was among the first things I packed. Then, on Dec. 6, 2009, disaster struck. The apartment complex where I lived in Erie caught fire in the middle of the night. Fortunately no one was injured, but the damage to the building and the individual units, including mine, was substantial. Once the shock of that experience had worn off and I knew that everyone had made it out safely, my attention shifted to what was left back inside. I was saddened to think of the loss of my new leather furniture, my TVs, even my extensive CD collection, but I knew those physical possessions were replaceable. In the forefront of my mind, all I could think about were the box of handwritten letters I had from Jessie and my dad’s ornaments. I was so grateful to receive this basket that morning. 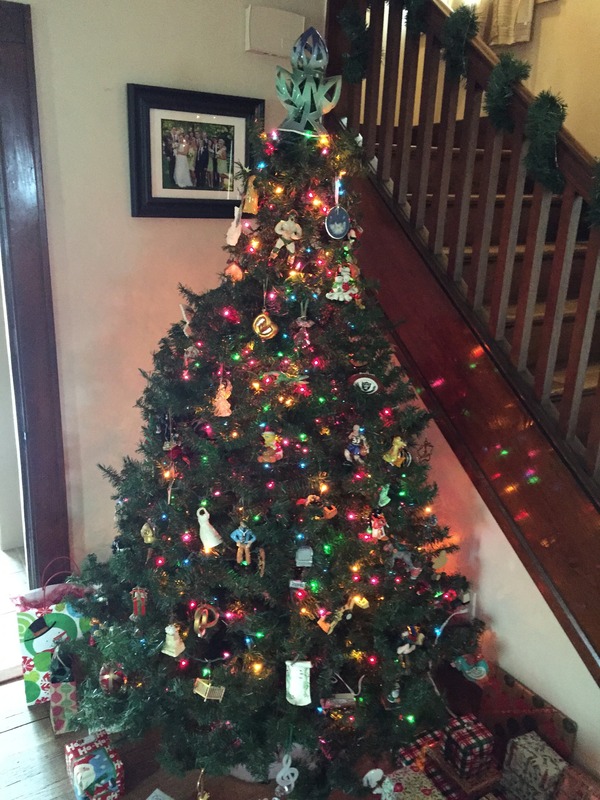 Almost every ornament was recovered. For obvious safety reasons, no one was allowed back into the apartment complex, even after the fire had been put out. There was no official word about if or when the tenants would be able to return to their unit to pick up the pieces and see if anything was salvageable. I just kept thinking that among that wreckage was my freshly decorated Christmas tree and all of my treasured ceramic ornaments, and I wondered if I would ever see them again. That morning my prayers were answered when a firefighter “rescued” the ornaments from my apartment amid the soot and ash after hearing my story from my now mother-in-law. Following the fire, I moved back home with my parents. 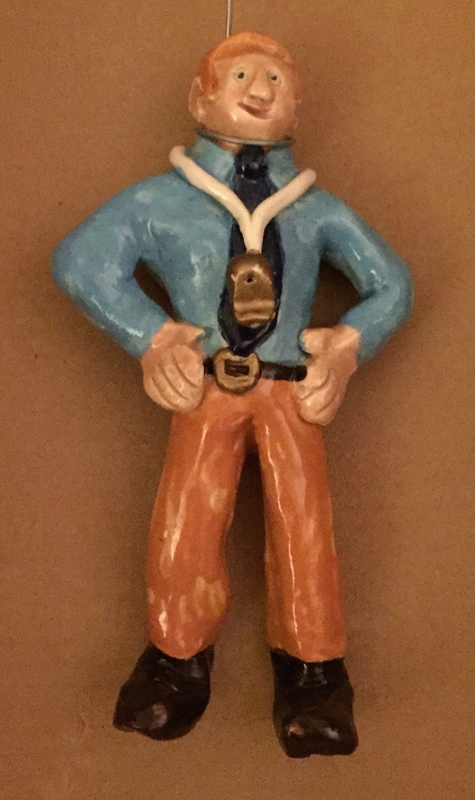 My dad remade a few of the most notable ornaments that were unable to be recovered. The whole experience only added to the significance of the ornaments in my life. When I next moved out/moved in, it was to live with my wife Jessie. She’ll be the first to tell you that my favorite part of Christmas preparation each year is putting up the tree, specifically decorating it with the many unique ornaments he has made for me over the years. Truth be told, each ornament has some level of special significance to me. At the very least it was meaningful enough to me at the time to represent that year for me. But I’m going to try to do the impossible and rank my top 30, keeping in mind that I have had slightly more than 30 ornaments in my 30 years since I got spoiled during the pre-sibling era of 1984-86. It’s worth noting that when I told my dad about my desire to compile this list, he helped me out by providing a list of which ornament came in which year dating all the way back to 1992. 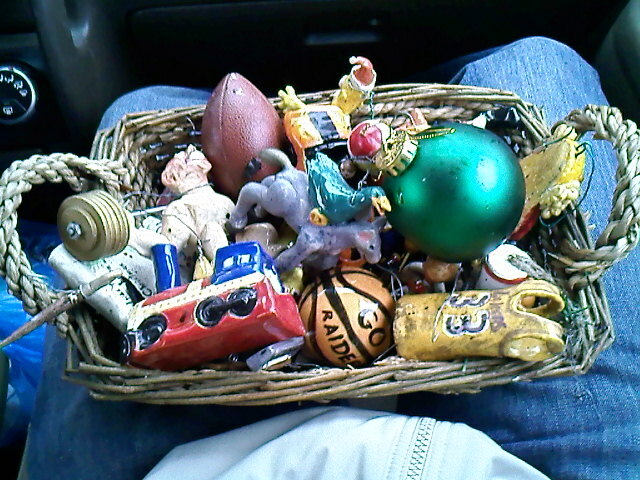 I estimated the dates for all of of the ornaments created before ’92 that do not have a visibly written date on them. The estimated dates are designated with an asterisk (*). I can’t remember back to age 1. 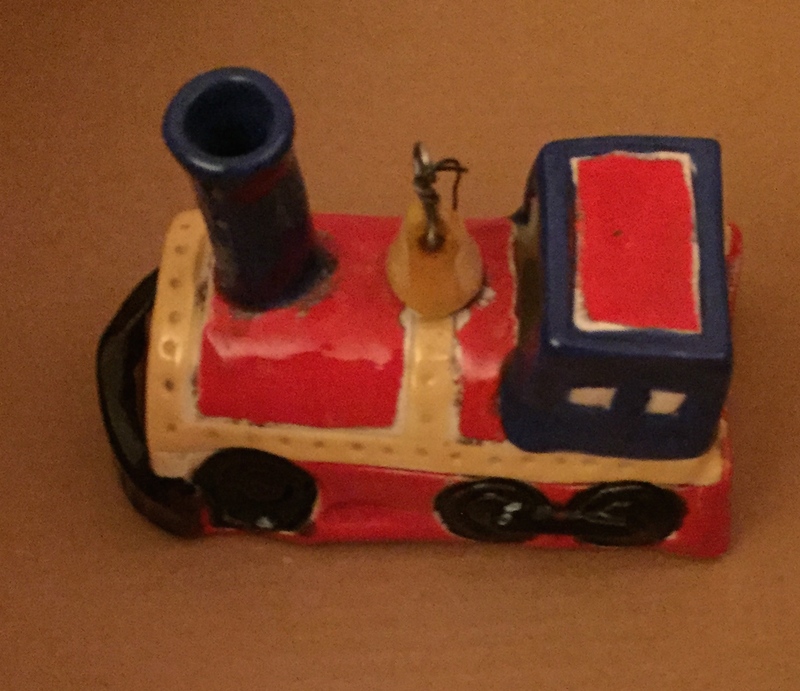 However, I have seen home video evidence that I was a big fan of the train set my dad would set up around the Christmas tree, so this seems like an appropriate ornament. Plus, there’s the whole Polar Express connection of trains and Christmas. Everyone has that awkward stage of adolescence, and I think mine must have peaked around 1997. I cannot begin to explain my thought process for this ornament. Why did I want a donkey? Why did I want a green duck? Why the combination of the two of them? It’s all a mystery to me. But year after year it puts a smile on my face when I unwrap it and think back on what a weirdo I was. I love the way my dad made them feel like they could be characters out of a Disney movie. Perhaps some day I’ll have children of my own, and I’ll write a short story about these two unlikely pals to read to them. This is arguably the most delicious looking ornament of the bunch. Can 2-year-old kids eat chocolate chip cookies? If so, I’m sure I had my fair share of them. Either way, I haven’t stopped enjoying them ever since. This isn’t the last food item to make the list. It seems appropos that my last Christmas as an only child would double as the only year to land two ornaments on this list. 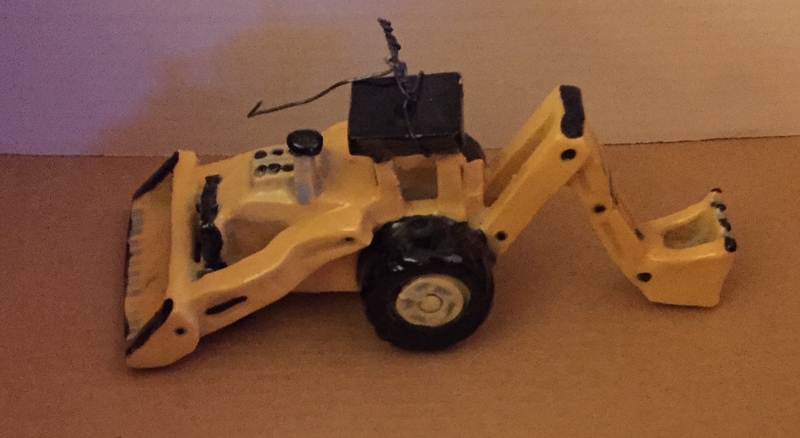 Since I was only 2, I don’t have quite the same nostalgic connection to them, but the backhoe was pretty cool. My dad’s car design here is cooler than anything I’ve ever driven, let alone owned. 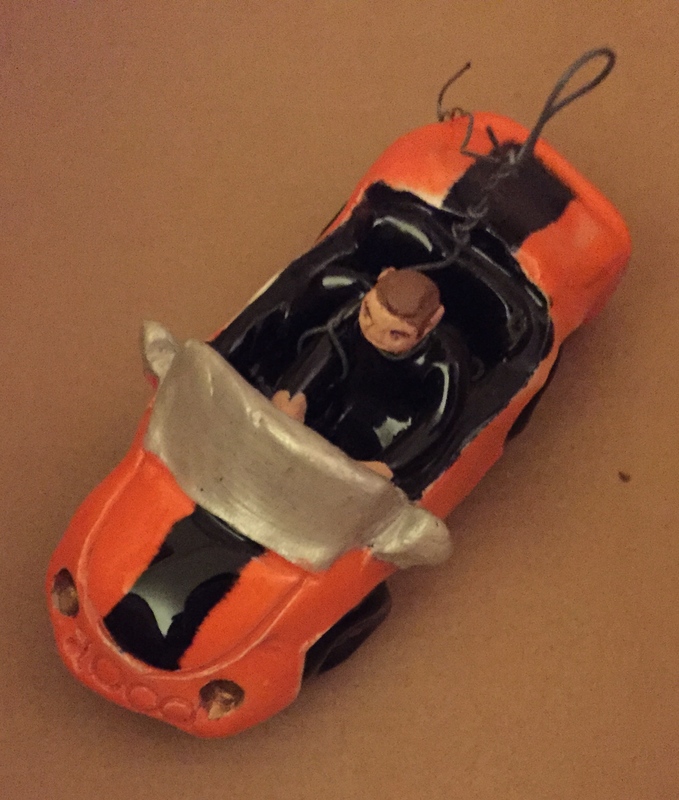 Although I never actually had a Cathedral Prep style orange and black painted car, this ornament commemorated me turning 16 and becoming eligible to drive. My mom deserves an extra shoutout for this one because she had the patience of a saint and took the lead when it came to teaching me how to drive. I’ve now had three stints as a basketball coach. Unfortunately all of them ended up being one-year gigs. This ornament came in the middle of my first ever season as a coach, serving as an assistant for the Villa Maria Academy boys basketball team for the 2006-07 season. I especially like the coach’s whistle on this one. If you read my 30 at 30 list of TV shows this one should not come as a surprise. I was a huge fan of Sesame Street as a kid. From Bert and Ernie to Snuffleupagus and Cookie Monster, I was a loyal, devoted viewer. 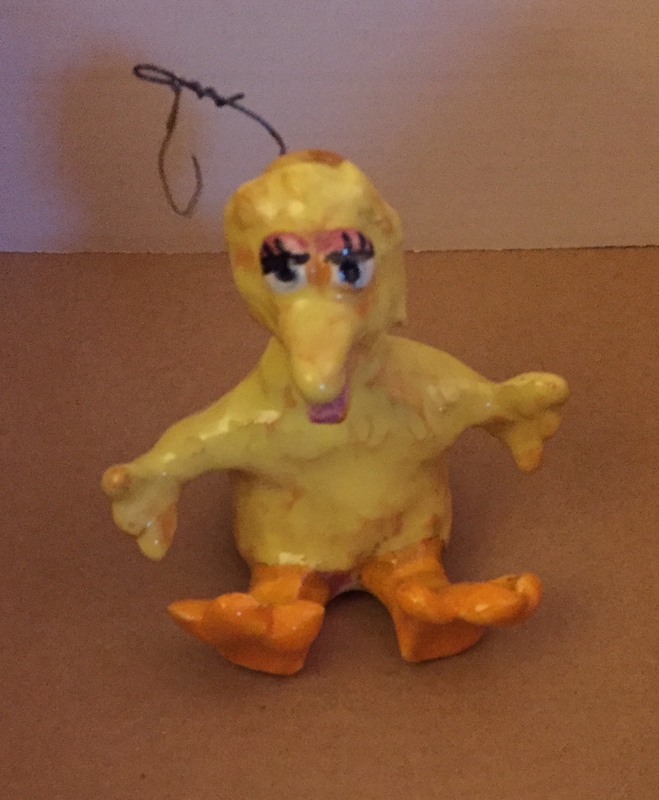 While I dressed as Oscar the Grouch once for Halloween, it was Big Bird who was the big star of the show and the character I chose to get as an ornament. If you look closely in the photo of the ornaments in the introduction, you’ll see that I actually had a second, mass produced Big Bird (in a Santa suit) ornament. It can’t hold a feather to my dad’s original in my opinion. Birds of a feather flock together. Joining Big Bird and the green duck on the countdown is Clutch, the mascot of the Erie BayHawks of the NBA Development League. I was a season ticket holder of the BayHawks for the past several seasons and also covered them for several seasons on both Blog Talk BayHawk and D-League Digest. 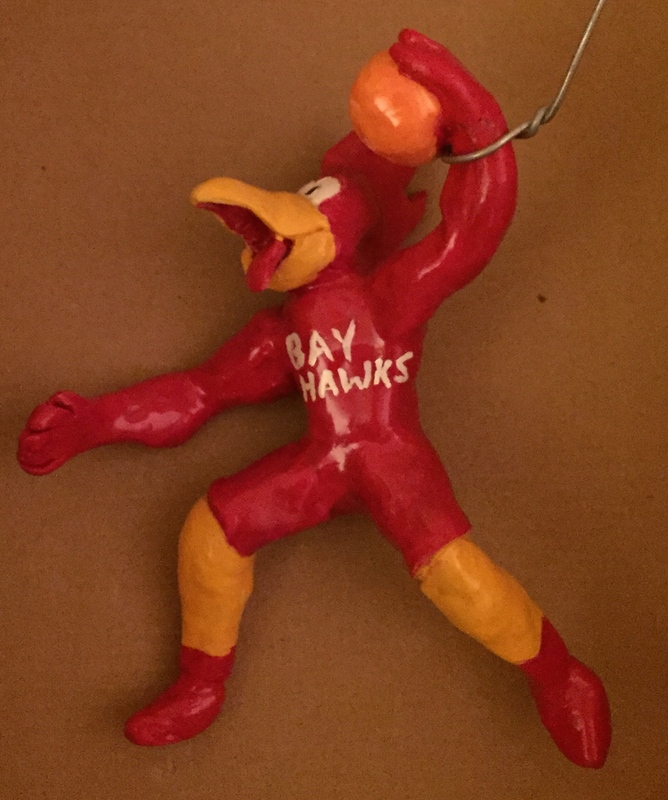 This ornament was the first one made after the fire, and I remember giving my dad a somewhat vague concept along the lines of “something to do with the BayHawks.” The dunking mascot was a really unexpected and cool way to represent my ornament wish for 2009. 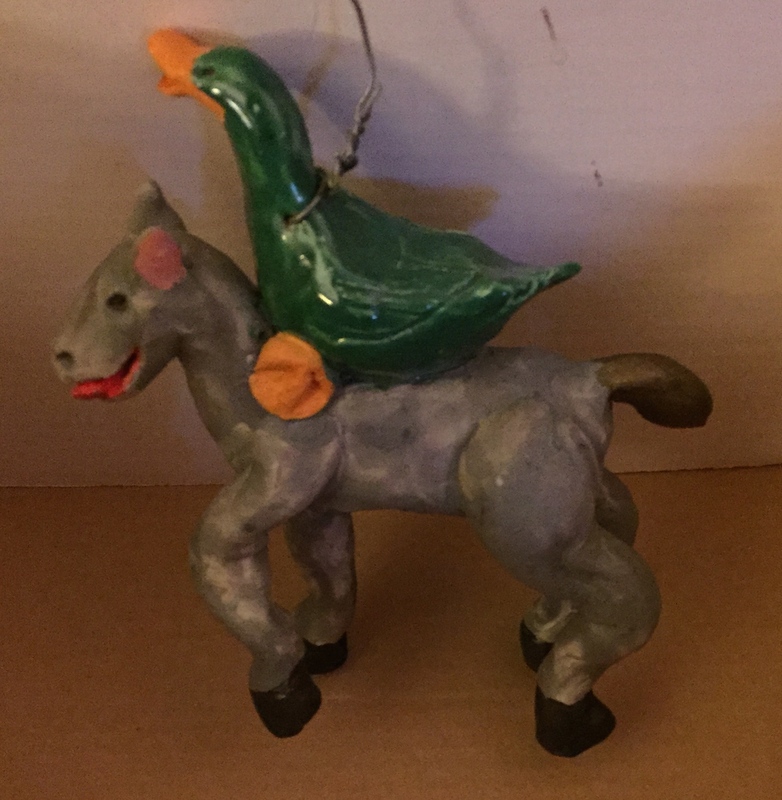 Speaking of non-specific requests, my 2007 ornament wish was probably among the least specific ones I ever made. I had just graduated from college in the spring with my English degree, so I wanted the ornament to have “something to do with writing.” My dad came up with the pen and scroll concept and added the Christmas tie-in as well. Had it have been me, it probably would have been a blank piece of paper and a pen. Thankfully, my dad took more of a creative and festive approach. Chris Webber was one of the Fab Five at Michigan who played in back-to-back NCAA championship games in 1992 as a freshman and sophomore before declaring for the NBA Draft. He was taken #1 overall by the Orlando Magic but traded immediately to the Golden State Warriors. As a rookie, Webber led the Warriors to the playoffs and earned Rookie of the Year honors. Although I was a Lakers fan, I proudly wore his #4 Warriors jersey and expected to do so for years to come, but Webber was traded in November of 1994 to the Washington Bullets. I then began wearing his #2 Bullets jersey. 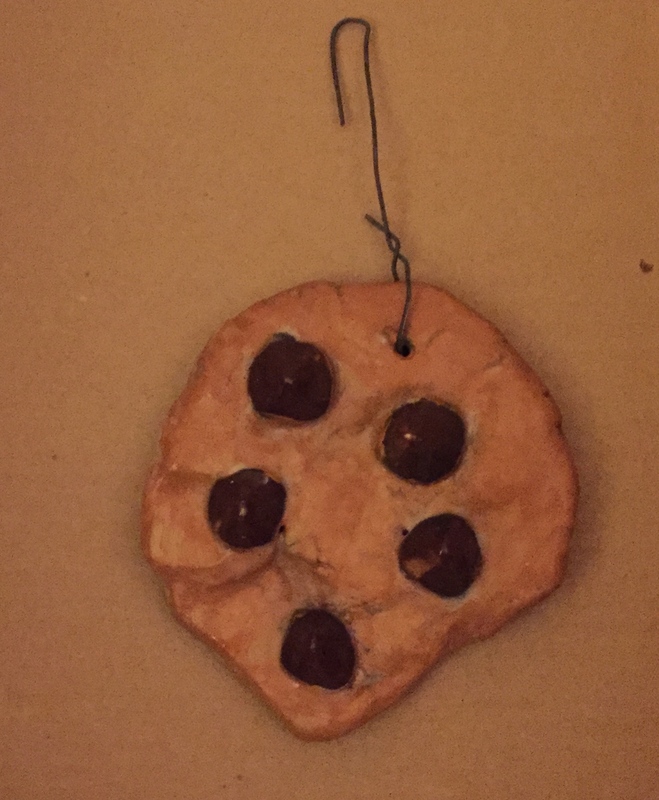 In honor of the sudden switch, I asked my dad to make a Webber ornament with the Bullets jersey on the front and the Warriors jersey on the back. 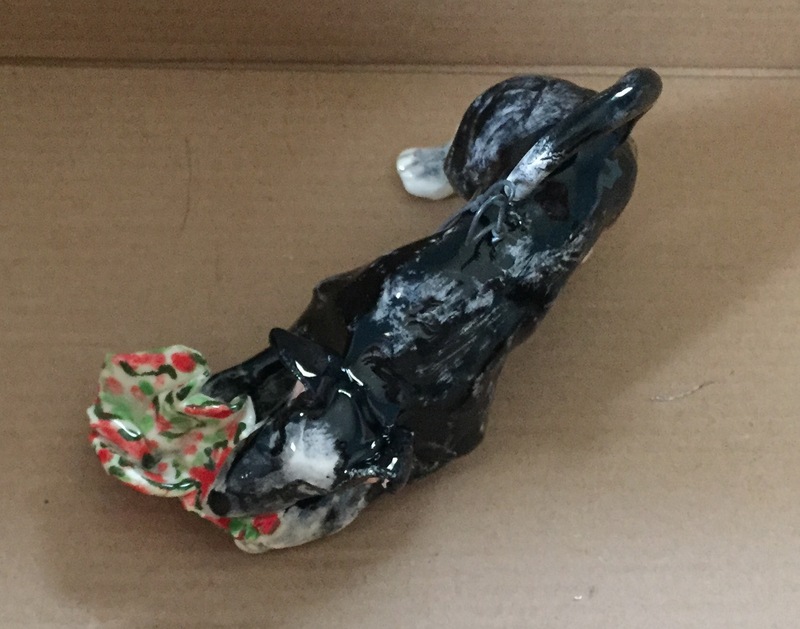 It’s important to note that this was one of the ornaments that did not escape the fire unscathed and not my dad’s subtle way of encouraging me to work on my left hand ballhandling skills. 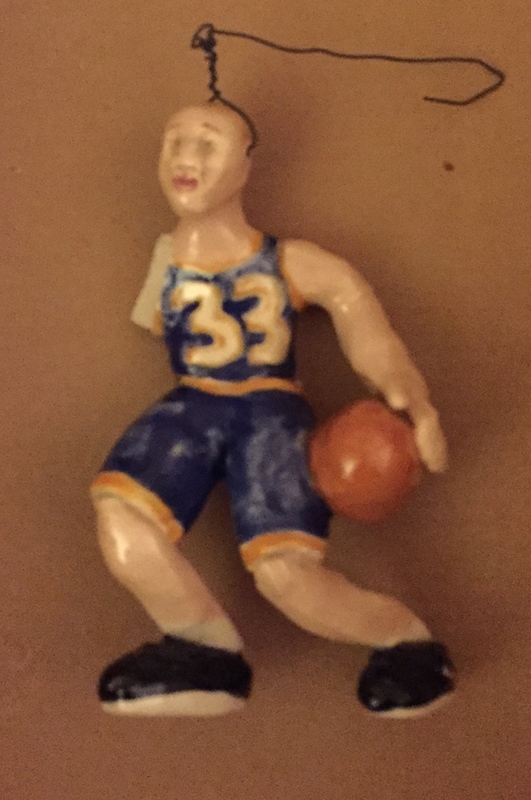 This ornament marked my first year of official parochial league basketball, but it wasn’t really an ornament of me because I didn’t actually wear #33. I know the ornament looks more like Larry Bird, but the number was an homage to Kareem Abdul-Jabbar. I averaged 7.6 points per game for the 5th grade OLC Raiders that season. I don’t know why my brain remembers sports statistics like that, but it’s true. Long before there was a MattHubert.com, there was HalfCourtHero.com. Sadly, I finally renounced the domain name earlier this year in a cost-cutting decision. For a time in the early 2000s, I used a streetball nickname and turned it into a website full of my writings and ramblings. I also designed several Half Court Hero T-shirts, many of which featured the HCH logo (also designed by me) as depicted on the ornament. It is fitting that the weightlifter ornament is the largest and heaviest of the ornaments made for me. In high school, I began making an effort to lift as part of a training regimen for basketball. My dad and I got memberships to Joe’s Gym where I learned some valuable lessons in terms of lifting technique and different types of lifts, including the deadlift and squat. I will never forget the incredible aches I felt in my quads, hamstrings, and glutes in the day days after my first day doing reps of squats. It wouldn’t surprise me if my face resembled the face of the ornament. I especially like how my dad put together the squat bar and weights for this one. I always sort of liked The Simpsons, but I became a fanatic during my high school years. I read Chris Turner’s Planet Simpson, which analyzes the show as a microcosm of Western culture. I bought and watched all of the old seasons on DVD. I even wore Homer Simpson slippers around the house. 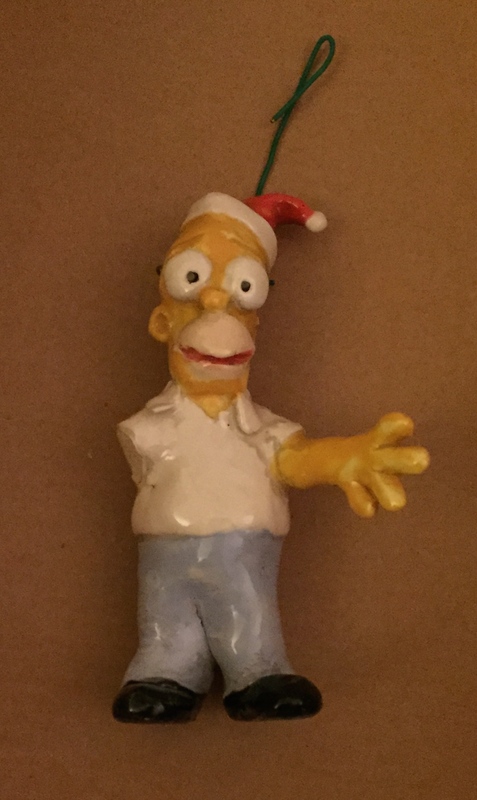 So it really should not have come as a surprise when I made Homer my ornament of choice months after graduating high school. Homer’s right arm was unfortunately another victim of the apartment fire in 2009. 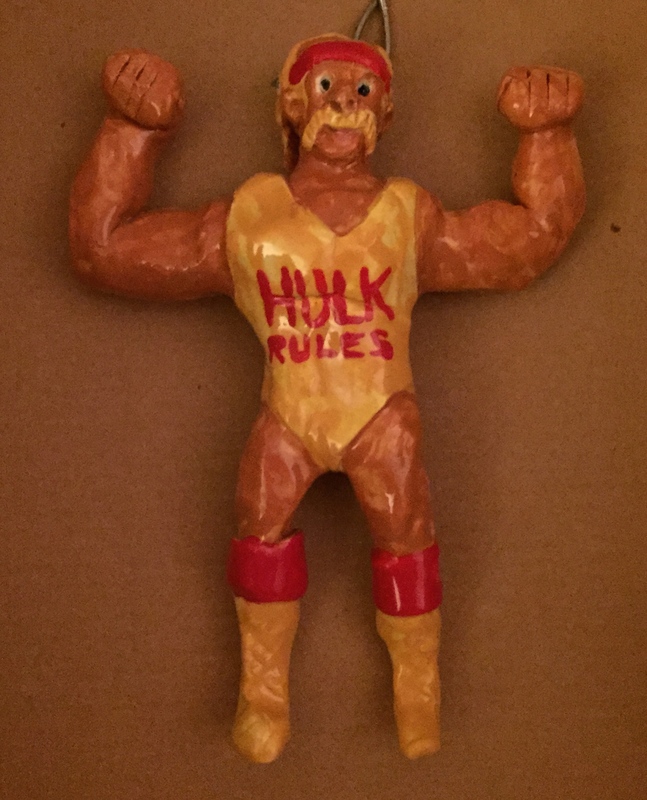 This is the ornament that started it all. If you’re familiar with my dad’s style, this piece definitely has the distinctive characteristics. It just seems like a baby-sized version of a Tom Hubert original, which is the perfect way to commemorate his first baby boy (me). There is a small chip from the fire in 2009, but other than that, it still looks as good as it did 30 years ago. The Ultimate Warrior was inducted into the WWE Hall of Fame earlier this year. Tragically, he died very soon afterward. Warrior was one of the most iconic wrestlers of my childhood. No one had more energy than the Ultimate Warrior. From the moment the first note of his theme music hit and he came sprinting down to the ring until the end of the match, which often wasn’t long at all, Warrior had the crowd in a fervor. I think my dad did a good job of capturing that in the facial expression and pose of the ornament. I know I’m biased, but I think Michigan’s winged helmets are the coolest in college football. Last year, when I was looking back on all of my ornaments, I realized that I had something Lakers and Raiders related, and I had the aforementioned Chris Webber representing my appreciation of Michigan’s basketball program. What was lacking was anything related to Michigan football. Since 2013 was a bit of a down year (I had no idea what 2014 held in store) and there wasn’t any standout player, I went with the iconic helmet instead. 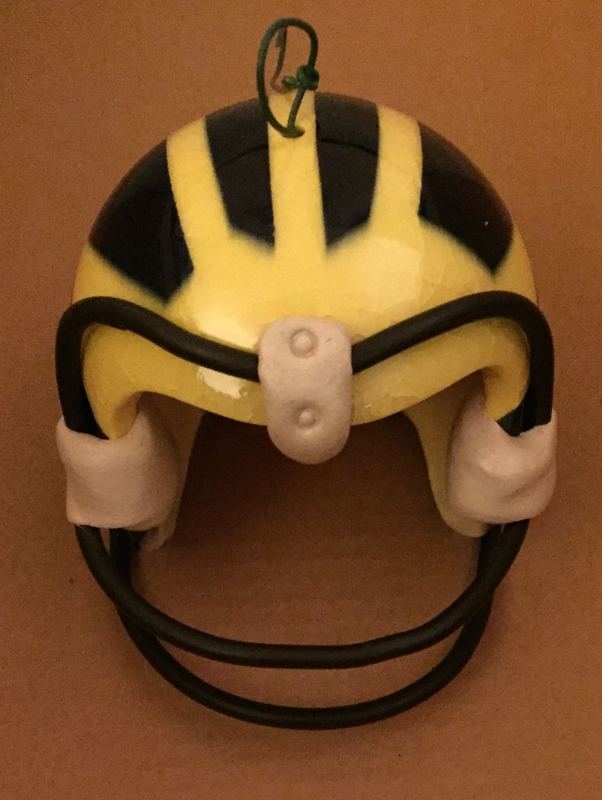 Unfortunately, Michigan’s talent hasn’t produced results like my dad did with this ornament. When I was hired at Cathedral Prep I figured that I would be welcomed into the English Department, but I had no idea that I would also be welcomed into the Thursday night bowling league at Polish Falcons Nest 610. In my first season, the team finished tied for last place and my individual average of 129 was among the lowest in the league as well. In year two, I improved my average to a 138 and the team finished in second place. Halfway through this season I’m bowling a 146 average and the team is in first place. 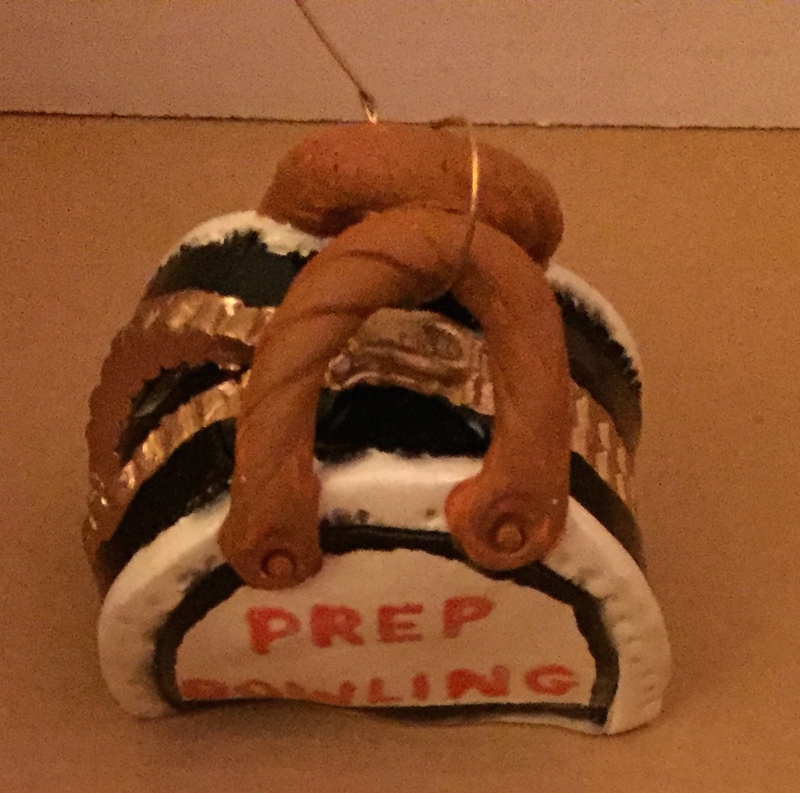 The bowling bag ornament is clearly here to stay! Ever since my dad brought home the Hubert family’s first Mac in the mid 90s, I was hooked. By the time I was a teenager, I had an Internet presence in the form of the Chat Room Wrestling League. I spent a lot of time recruiting members, writing newsletters, organizing cards, and putting on live events in chat rooms. It goes without saying that I had more online friends than real friends during this time in my life, but I had a blast. 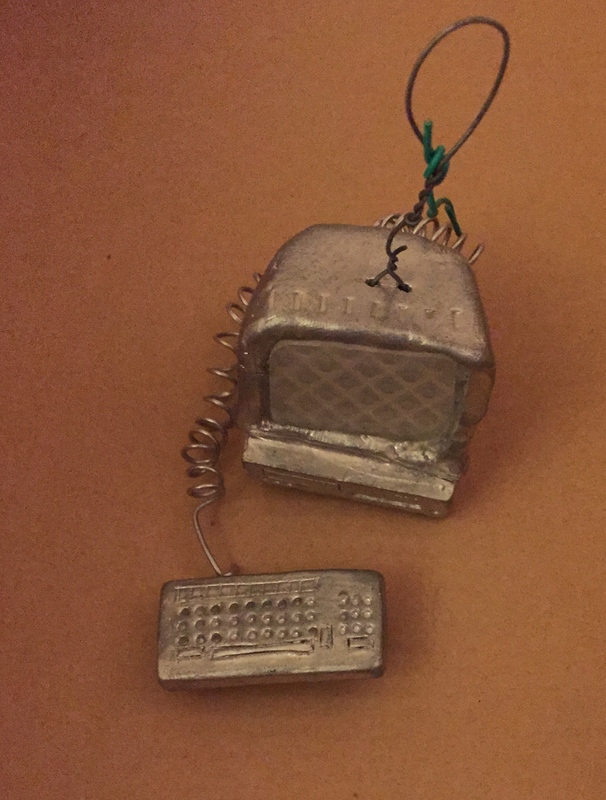 This ornament, which was a nod to the countless hours I spent online each day, featured the coiled wire connecting the monitor and keyboard. When my family dog Rocket passed away back in September, I was pretty shaken up. Even though I hadn’t shared a house with him since getting married and moving out more than three years ago, I knew I would be sad when the day came. Still, the sadness hit me harder than I thought. The 30 at 30 memorial list I wrote was a cathartic experience for me, but I wanted another more tangible memorial. 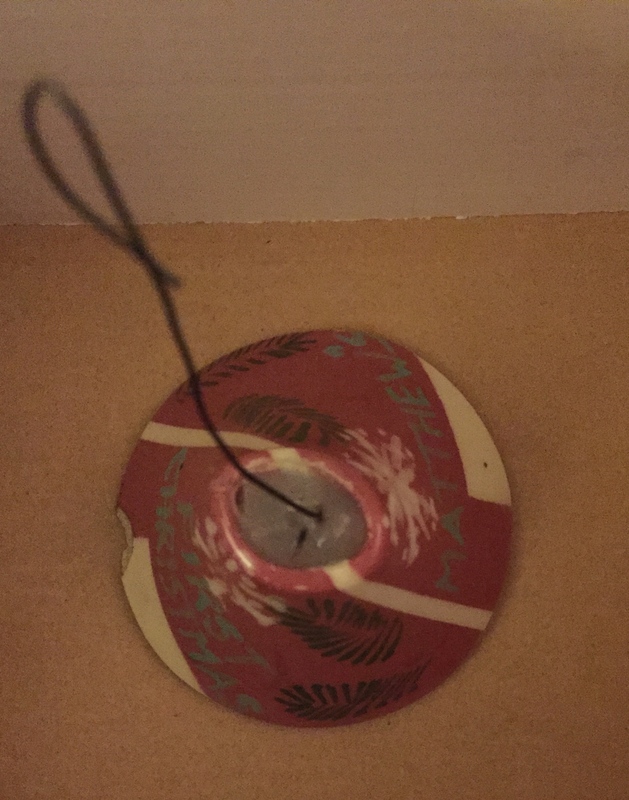 So when it came time to ask for my ornament this year, I asked for my dad to make a Rocket ornament, specifically one of Rocket tearing opening the wrapping paper on a gift, which was one of my favorite memories of him. Rocket wasn’t a Christmas gift, but I will always think of him at Christmas time because he truly loved opening gifts. It made me laugh year after year, and I will definitely be sad when we open gifts as a family this year and he’s not around to participate. This was one of the most unique concepts my dad ever did. After getting engaged in July, Jessie and I got identical halves of this oversized engagement ring as our ornaments that year to place on our respective Christmas trees. 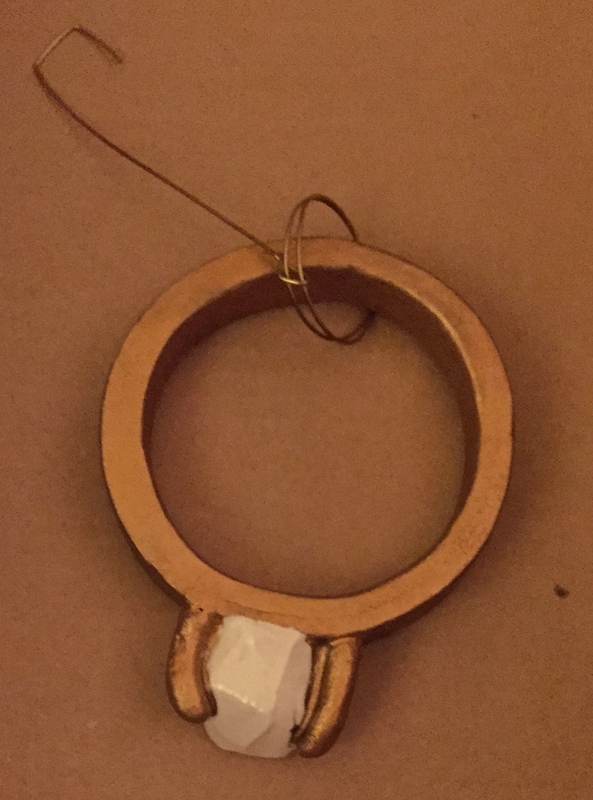 The following year we were married, and every year since we join the two halves together on our shared Christmas tree as one complete ring, symbolizing our unity in marriage. As a senior in high school, there weren’t many things cooler than having a car. After working for a year at Giant Eagle, I had saved up enough money to buy a used blue 1993 Honda Civic. I named him Cedric, and together we shared a lot of great memories. Although it wasn’t quite a convertible like the ornament suggests, Cedric the Civic was cool just the same. Visually, I think this is one of the coolest ornaments on the tree. The details that went into the pepperoni, the sprink;ed mozzarella cheese, and the slices of pizza are tremendous. 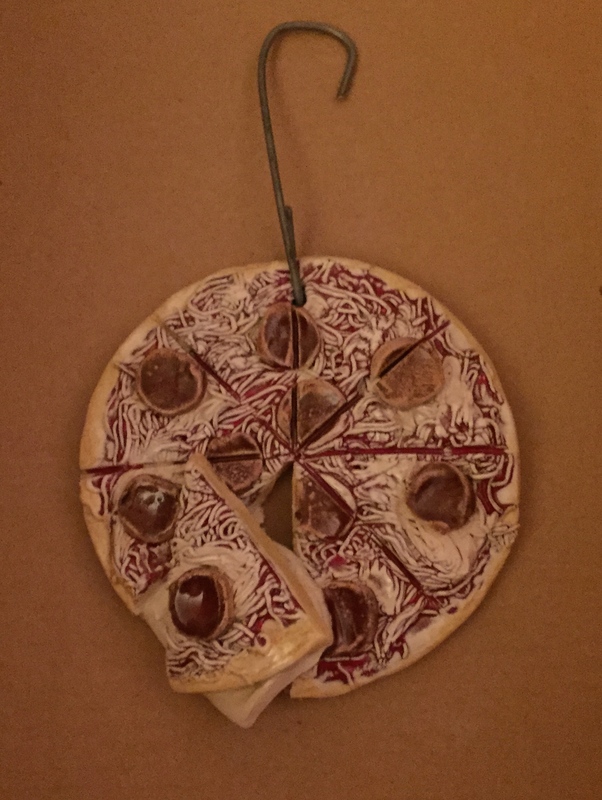 Sadly, the pizza ornament was another ornament damaged in the fire. The pizza itself made it through unharmed, but the handle broke off of the spatula that was lifting out one of the slices of pizza. For all those who believe there is beauty in simplicity, this is the ornament for you. My love of basketball, even at a young age, made this an easy choice. I always get a chuckle seeing “Go Raiders” on a basketball because it’s a confusing message at first. The reasoning is simple though. I played grade school basketball for the Our Lady’s Christian School Raiders, so that’s the reference; it actually has nothing to do with the NFL franchise. The ornament itself both looks and feels great. The spherical shape and smooth texture is unlike anything else in the collection. My love of Counting Crows grew exponentially after seeing them live for the first time when I was a senior in high school in 2003. Two years later, they remained my favorite band, and I knew every song by heart. Despite the fact that lead singer Adam Duritz is 20 years my elder, I’ve always viewed him as a soul brother. Music, particularly Counting Crows music, was so influential to me during my 20s, so it made a lot of sense to request a Duritz ornament. The Duritz ornament was another casualty of the fire in 2009. The original had an orange shirt and blue pants, but my dad made sure that both of them featured his distinctive dreadlocks. If you haven’t read my 30 at 30 list of WWE personalities yet, then you might be surprised to see Bret Hart in such a prime position on the list. When I saw WWE live as a child, one of the coolest things I took away were a replica pair of the Hitman’s iconic shades. 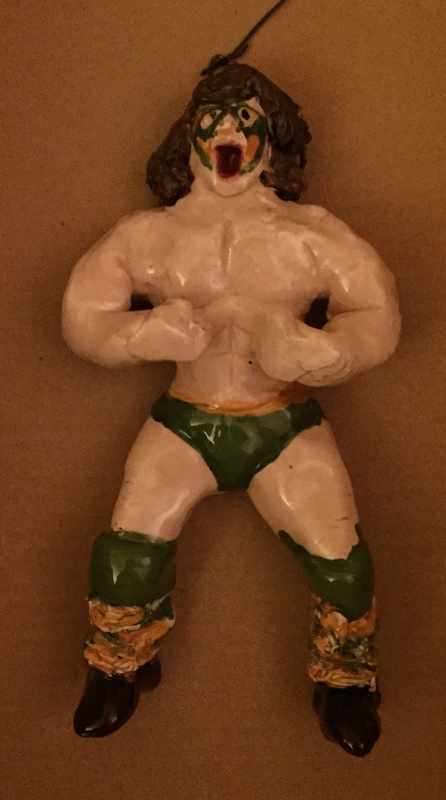 The Hart ornament and all of the wrestler ornaments serve as fond reminders of Christmas mornings gone past when many of the gifts I opened were WWE action figures. 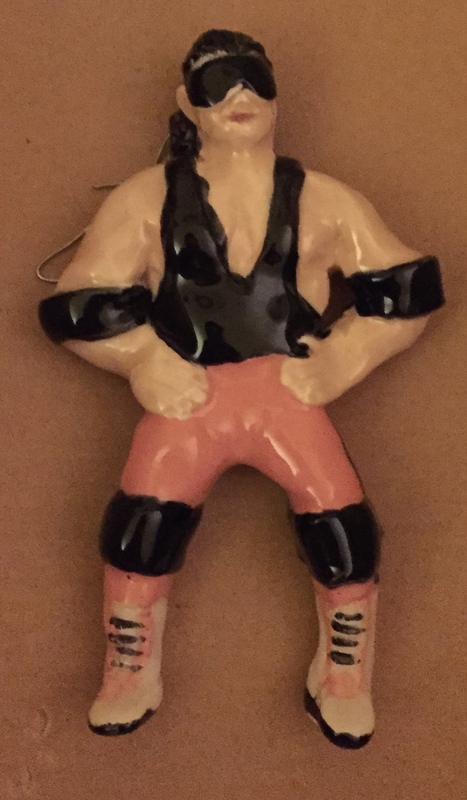 Disappointingly, Santa never left a Bret Hart LJN figure under my tree, but my dad’s ornament more than made up for it. My favorite NFL player of all-time only played 38 games over 4 seasons. But Bo Jackson made a huge impact during his short time in the league. Even more impressive than his performance on the field was how his reputation affected his performance on the virtual field. Tecmo Super Bowl’s Bo Jackson was the single most dominant running back in video game history. 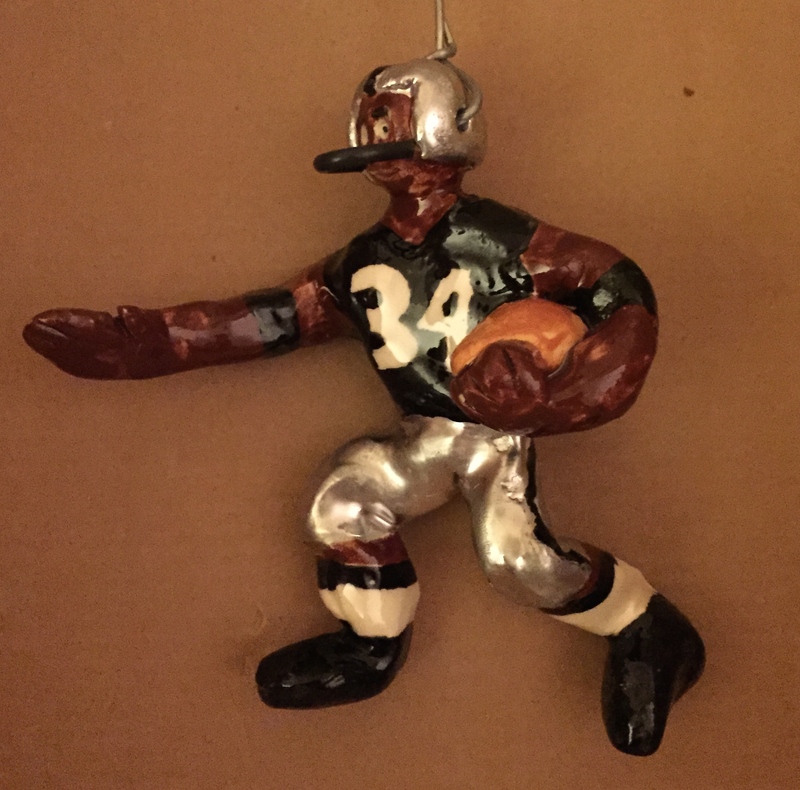 Tragically, Bo’s football career was cut short about a month after this ornament was made when he injured his hip against the Bengals. 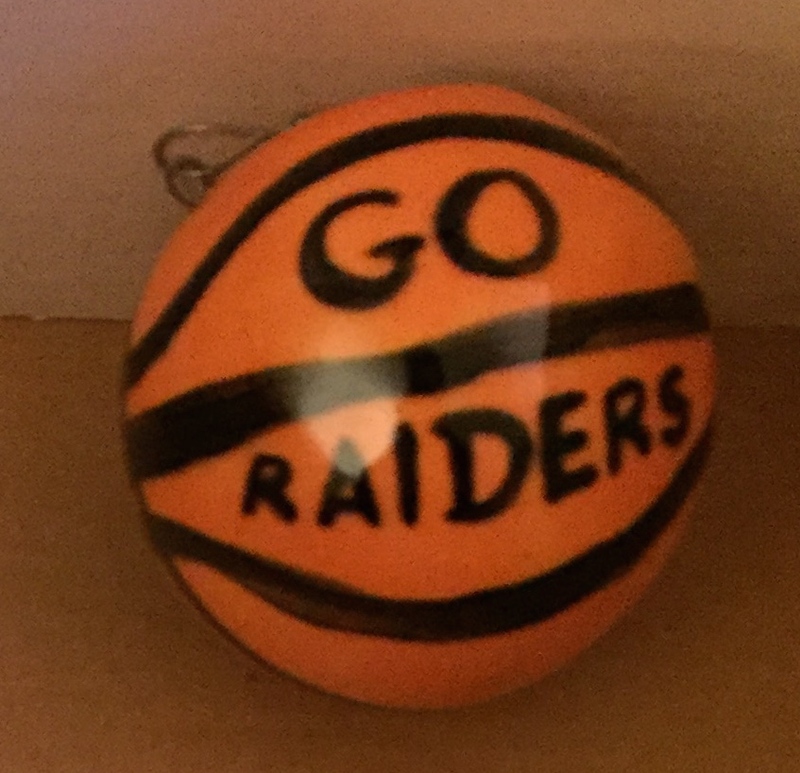 Years later, the ornament itself was lost in the fire, but my dad remade it with a shinier, more true-to-life Raiders silver, making it even better than the original. If you look near the top of the Hubert Christmas tree, you’re bound to find the gold #33 Los Angeles Lakers jersey of the NBA’s all-time leading scorer. The tree already had a number of athletes on the tree, so I wanted this one to somehow be different and stand out. When I think of the Lakers, I think of their proud winning tradition and the rafters of the old Great Western Forum being adorned with championship banners and the retired jerseys of Hall of Famers like Abdul-Jabbbar, Magic Johnson, and Jerry West. In my mind, I expected my dad to make the jersey flat, but instead he made it 3-Dimensional, with a hollow inside that gives it a very neat visual effect when it’s hanging on the tree. My life forever changed for the better in the summer of 2011 when I married Jessie. Her ornament that year was a ceramic miniature replica of her gorgeous wedding dress. My ornament was this replica of our wedding cake. 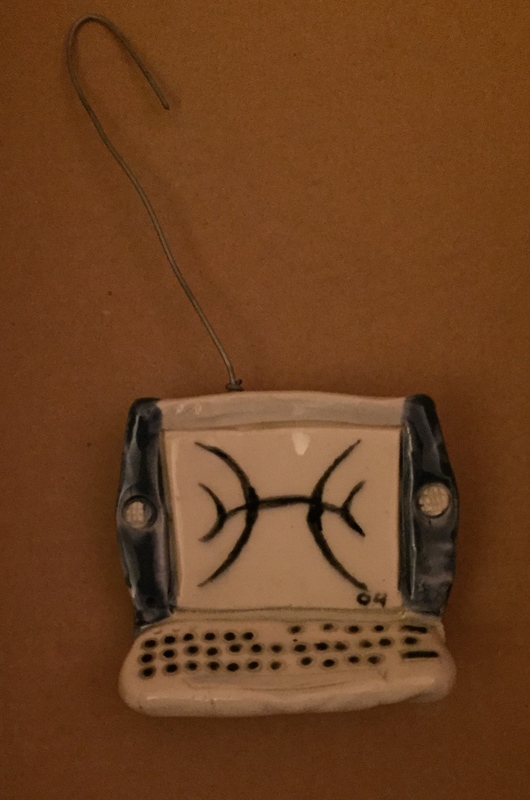 As an aside, the “star” or “angel” atop our tree is also a ceramic piece designed by my dad. We asked him to create a ceramic wedding cake topper using the colors of our wedding theme, and he made us four different options. 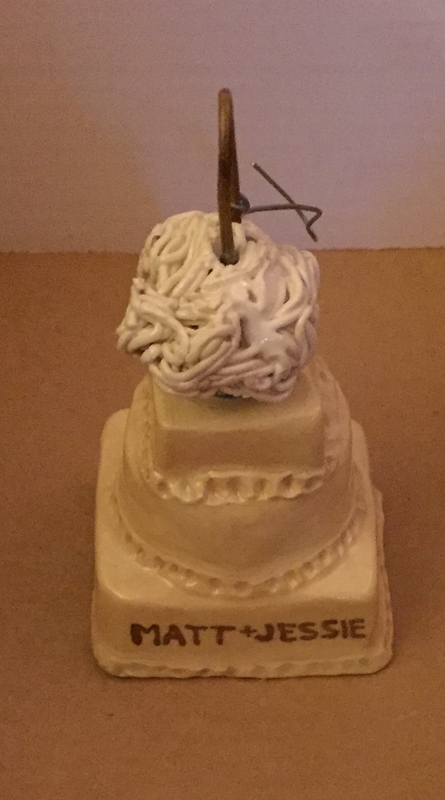 We selected one as the cake topper, and the other three were all re-purposed elsewhere. We felt that one of them fit perfectly atop our Christmas tree, and so that’s where it is today. Together with the cake, it’s a Christmas-time reminder of how lucky I am to love and be loved by such amazing people. Lots of great memories of making all of them. You even reminded me of things that I forgot already about why I made some of them the way I did.